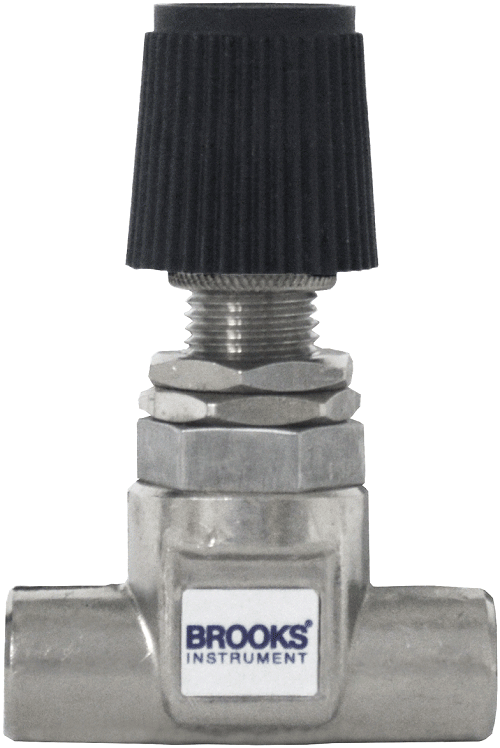 The Brooks® NRS™ (non-rising stem) flow control valves are designed specifically for extremely low flow gas and liquid applications. Straight and 90° angle pattern models in stainless steel are available. Ideal for rotameters with needle valves, the line allows needle valve flow control by adjusting a sliding tapered needle. This prevents sticking caused by foreign matter in the fluid. These flow control valves are particularly suitable for precise control requirements and possess a high turns-to-lift ratio. The flow is constant for any given stem position. Six needles with different tapers provide a wide choice of flow ranges. Needles and orifices can be changed without removing the valve body from the line (two different orifices are used, one for needle sizes 1-3, another for sizes 4-6).